March 2008: In the previous chapter, we looked at how 2000 AD's first lineup of 2008 was completely terrific, but honestly, the Judge Dredd Megazine is every bit as wonderful. At this point, issue 269, the structure is quite similar to what readers in the present day will find in the issues on newsstands, except for the polybag and the little reprint comic; those come a few months down the line. Each issue contains contains about thirteen pages of text and articles, and four strips. The major text feature is an interview with one of the many artists or writers who've worked on the Galaxy's Greatest. The previous three issues had featured a detailed talk with Alan Grant. This time out, it is artist John McCrea, who also contributes the colorful and wild cover painting. Of the strips, one is a creator-owned property, and this time out, it is Bob the Galactic Bum, about which, more in two weeks. 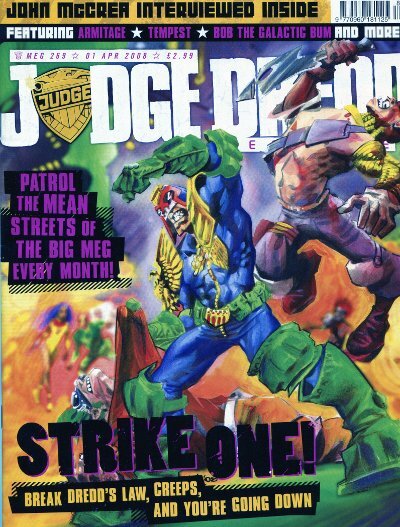 One of these is a ten-page Judge Dredd episode, and it's backed up by two nine-page episodes from the Meg's stock of characters, usually set in Dredd's universe. It's not quite ideal, and the running complaint for the last five years, at least, has been a desire to see some more comics and fewer movie reviews. With thirteen issues a year, that's only 26 slots for new non-Dredd episodes, and leaves everybody wishing for more. This time out, the backup slots are filled by Armitage by Dave Stone and John Cooper, and Tempest by Al Ewing and Jon Davis-Hunt, and they are both excellent. This is the first Armitage story in five years, and it's a very welcome return for the cranky old detective. It proved to be very popular, and the character has, happily, been a more frequent guest ever since; three further stories have appeared since this one, and they've all been terrific. For those unfamiliar with the character, he's a plainclothes detective judge in the very corrupt world of Brit-Cit, where, in a world not entirely unlike the Oxford CID of Colin Dexter's Inspector Morse, you can only advance so far up the chain of command without approval from old fraternal orders and secret societies. Armitage has been investigating weird and violent crimes with great success, but has made lots of enemies. He's a terrific character, and for the first time since the early 1990s, he'll have a consistent look across three stories, as John Cooper becomes his regular artist. Personally, I think that Cooper is a terrific choice, and he really does a great job visualizing the unhappy, tough, lowered-eyebrows look of Armitage himself, just as he had done decades before on such comics as Johnny Red in Battle Picture Weekly, and, later, the popular Action Force. Clearly, Cooper's artwork has an old-fashioned look, and, while I'm a big fan, even I can't claim it's really successful in conveying the future shock of this bizarre metropolis. Writer Dave Stone was, earlier this year, a little more direct, praising the series' most recent artist, Patrick Goddard, in comparison with Cooper: "I'm liking how Armitage turned out, if only cos it now looks like it was drawn in the 1990's (sic) rather than in 1974." Yes, Cooper is certainly from an older school, but I contend that he did a fine job anyway. 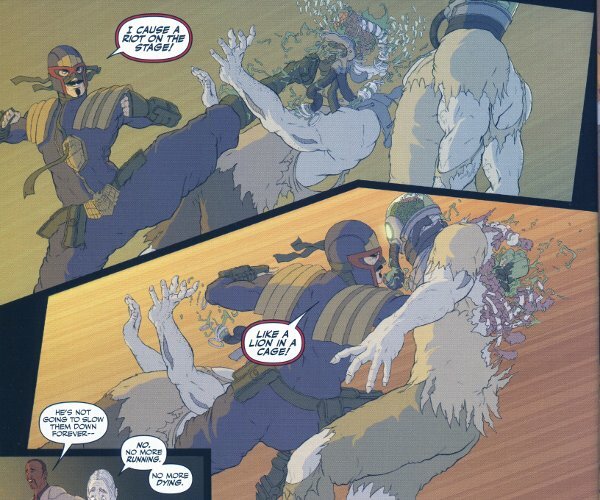 Some of the series' earlier outings had, unfortunately, been undermined by artists who confused the storytelling and the layouts. Even the reliable John Ridgway had left 2003's "Apostasy in the UK" something of a chore and a challenge to follow. Cooper just makes things incredibly clear, and even if his style is not to Stone's liking, he really succeeded in getting things done well. Stone doesn't get a lot of press or fan attention, but he's a really excellent writer who enjoys the craft and the tradition of writing. In his interviews and forum posts, he really shows off a lot of critical knowledge of his peers, knowing what works and what does not. In "Dumb Blond," he does a magnificent job hiding a clue in plain sight. The reader is supposed to wonder, after a couple of episodes, whether the title might be misspelled, because the story seems to be centering on a female victim, and should therefore be spelled "Blonde." This is reflected in the story itself, giving Armitage just that extra bit of insight. It's a very clever bit of detective fiction, really wonderful writing, and it's certain to leave readers wanting more. Some of the earlier Armitage stories have been reprinted in the freebie-floppy "graphic novels" (in Megs 287, 289, 290 and 304), but some bookshelf editions are long overdue. I count about 446 pages of Armitage, plus 30 of his partner Treasure Steel. They could do that in two books; three if the editor would be so good as to commission a long and proper run of stories for the next few years. I didn't leave myself much time to talk about Tempest, who is the first ongoing character to be created for the comics by Al Ewing. The writer had previously written some one-offs and a short serial called Go-Machine, but this is the first time he tackles something with legs. This first adventure, drawn with dynamic panache by newcomer Jon Davis-Hunt, starts following a con artist in Mega-City One ripping off a crime boss of many millions, only to be caught almost instantly, so he flees to the Undercity. The Undercity is one of my favorite concepts in Judge Dredd's world. The quite goofy idea is that huge chunks of present-day America, including Manhattan in its entirety, had been simply concreted over as the Mega-City was built. 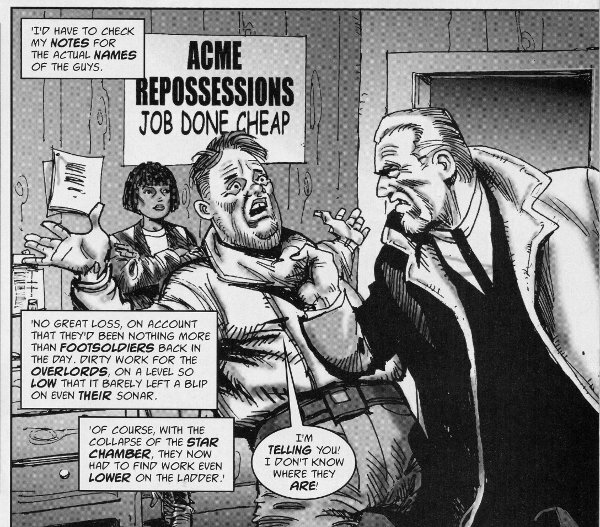 This has resulted in some pretty stunning imagery in the hands of the series' artists - Arthur Ranson's depiction, in an old Anderson: Psi Division story, of a darkened, ruined Times Square under a concrete sky is breathtaking - and a host of wild ideas about what kind of villainous evil is thriving underground. Everything from mutant armies to werewolves to pied pipers to Aliens have lived down here, and now our hero has to navigate them in a desperate search for some old computer databases. Suddenly, there's this incredibly violent and powerful mustached clown in some sort of downmarket judge uniform who insists on helping him out. After surviving some ridiculous, over-the-top threats, capped by a delicious cliffhanger wherein Tempest asks his hapless ally exactly when it was that he ever actually claimed to be a judge, Tempest tells his backstory - his secret origin, if you will. It is balderdash. It's one of the best examples of an unreliable narrator in comics, flatly and matter-of-factly telling an unbelievable tale about a zen supercriminal and a dedicated, by-the-book supercop called Judge Tempest who's devoted decades to proving his existence. The whole thing is just huge fun, and it's a big shame that when Tempest returned in 2010, it was in a story not nearly as entertaining. Next time, it's back over to the weekly, to observe that the spring lineup is... well, not quite as strong. In fact, it is a mess. See you in seven days!